Air Force Social Action "Our Lady of Loreto"
The Colombian Air Force's full organizational chart (from the Air Force's official website) is located here. On the operational level, the Air Force is divided into Comandos Aéreos (Air Commands), which in turn have several Grupos Aéreos (Air Groups) and these are divided into Escuadrones (Squadrons). There are also several independent Air Groups as well, which will most certainly turn into Air Commands when they reach the proper capacity and infrastructure needed both in manpower and airpower. - Grupo Aéreo del Oriente (GAORI) "CR. Luis Arturo Rodríguez Meneses" (will soon become CACOM 7): official website, no flag reported on official website, CoA. - Instituto Militar Aeronáutico (IMA) "CT. José Edmundo Sandoval": official website, flag, CoA. Last February 8, 2013, a new Combat Air Command was set up with its respective flag. A picture gallery of this activation ceremony can be seen here. Standard of GRUCO-41, taken from http://www.cacom4.mil.co/index.php?idcategoria=3015. The CACOM-4 has an Air Group, called Grupo de Combate (Combat Group) 41 (GRUCO-41), and this is its Standard). The GRUCO-41 has an eagle as its insignia, seen here. I located the Air Force flag at <elpibe.urc.net.co>. The flag with the crest and white background seems to be the official one. They probably changed it since I remember seeing the same coat of arms but on a different background (more like a light blue one). In every TV appearance of the Air Force flag, I have always seen that flag. Photo of the flag at <www.fac.mil.co/simbolos>, arms at <www.fac.mil.co>. A government decree no. 126 of 31 December 1919 to form aviation element of Army was the first step for the establishement of Fuerza Aérea Colombiana. On 4 April 1922 Aviacion Militar was formed and it was renamed in 1943 Fuerza Aérea Nacional and renamrd again in 1947 to its current name. Homepage at <www.fac.mil.co> . 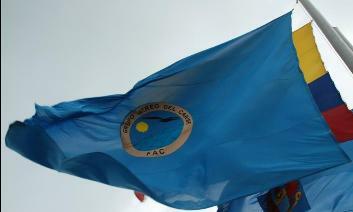 The FAC flag was established by Resolution on May 24, 1971. Since all official flags have the tricolor plus coat of arms as their template, here's an actual picture of the Colombian Air Force War Flag showing the same design pattern and below the initials FAC. Image taken at an Air Force Base on March 5, 2016. Light blue, the national flag in the canton, the air force roundel (8 points star) in the fly. Source: Christian Fogd Pedersen: Moussault's lexicon van vlaggen en wapens (Alverdens flag i farver), 1980 [ped80]. ENSIGN (Roundel): This is the ensign that the Colombian Air Force uses since 1950 in all and each one of its aircraft which goes by the following pattern: On top of the left side (wing), below the right side (wing) and on the tail, one on each side. In the middles it has a five-pointed white star and on its borders is the national tricolor inverted. The Album 1995 issue [pay] show another flag wich is omitted from Album 2000 [pay00], but I think only due to the editorial policy and not because the flag is obsolete. That is the Air Force Ensign, of the clasical pattern - light blue with the national flag in canton and the roundel in fly. I think that this flag is not obsolete indicated, and that the Air Force flag of different design does not replace it - this other flag serve entirely different function - it is the flag of the Air Force as a branch of the defence forces, in the same way as there are similar flags for other branches. In the front dor of the Military Hospital, in Bogota, Colombia, there are three flags in plain color: dark blue, light blue and red. I supose that the flags are just versions without the coat of arms, of the flags of the Army (EJC), Navy (ARC) and Air Force (FAC). António Martins wrote: "These seem to follow the british pattern...". Given that Colombia military airfield flag follows a British pattern: sky blue flag with national flag in the canton and roundel in the fly; and that Britain had a lot of influence in Latin America post independence, that would be a fair guess. Flag spotted on 6 June 2008 at Eldorado Airport, Bogota. It was hanged on an hangar and I believe that it belongs to one of two Air Force units: CAMAN or CATAM that are located in this airport. This is the Colombian Air Force's Crest. It reads "Sic Itur Ad Astra", which means "Like this you go to the stars". THE EAGLE OF GULES: She was made the symbol of aviation itself. As the queen of all birds she is the symbol of the empire that the AIR ARM exerts over Colombian skies, winds and storms; she is a living image of the power and freedom of our fatherland. Her color is gules or blood and/or fire red, that war or martyr heroes have; it speaks clearly about the transparence and energy of love. It also shows the strength of the spirit and and the ability to dread, primary virtues of those who are part of the Colombian Air Force and incarnates in its blason , manhood, victory, valor, ellegance and courage. The center of the crest is in Azure (Turqueoise Blue) with an horizontal chief that holds two sabre blades, meaning guard, truth, loyalty and beautifulness. Its title, also in gold, says "SIC ITUR AD ASTRA" which translates "Like this you reach the heigths". The golden color symbolizes the "light and commitment, the greatness and wisdom". This is, at a glance, the formidable heraldry of the crest that was made into the symbol of our institution. Its motto was taken from Eneida de Virgilio in his book IX, Chapter V. The crest's origin was from a contest promoted by the Colonel Arturo Lema Posada, then commander of the military aviation and formalized by the Decree No. 2963 of the 26th of December of 1944, being President of the Republic Alfonso López Pumarejo and Minister of War (Today Minister of Defense), General Domingo Espinel. According to [pay00] - Aircraft Marking - A note to the figure explains that the national flag is painted on the fin as Fin Flash. The marking is a roundel divided horizontally and lower part again vertically in yellow, blue and red and in the center covered with a disk divided horizontally in red, blue and yellow (yellow covering the whole lower half), and over it in the middle a white star. The star is a five-pointed star in Album 2000. In Album 1995 the star is of eight points, and as far as I have observed - ight-pointed star is preffered star shape throughout the Colombian history - so I am inclined to believe that the five-pointed star in Album 2000 might be an error. Other source by hand is [zna99] with eight-pointed star also. According to Cochrane - military aircraft insignia [cos98], the star was changed to 5 points in 1953. Wheeler Aircraft Markings [whe86] also gives 5 points in 1986. According to [cos98], since 1925 the FAC use its complicated roundel, and the only change was in 1953 when the star was changed to 5 points star and instead of a roundel as fin flash, came rudder stripes. See: <www.skytamer.com> (1925-1953) and <www.skytamer.com> (post 1953). Jane's 1945 report 8 points star and national colors as rudder stripes. [whe86] report a 5 points star an a sqare fin flash. <www.aeroflight.co.uk> also report 5 points. Photo at <www.airliners.net/240294> show clearly a 5 points star as well <www.airliners.net/240293> . Unfortunally, old photos are so unclesr and the star so small, so I can't have a good one. We shall have to trust the books on this. The rudder stripes are used on uncamoflagued planes. Combat planes carry a small flag as fin flash (see <www.scramble.nl>). The low-visibility version differs somewhat in layout from the regular roundel, too - the inner ring is a bit larger, and the cental star noticeably smaller. Source: photo at <www.fac.mil.co>, reported by E.R. Third roundel. Established by Decree No. 289 of February 21, 1927 (1927-1953). "75 Años en los Cielos Patrios", published by Editorial Margabby Ltd., First edition in 1994, by FAC Lt. Col. (r) Oscar Forero Racines. Different versions of two roundels appear in this source. They differ from Željko's existing gifs at in that the star in the 1927-53 one has 9 rays, not 8, and both have a different division of red/blue in the inner ring. They should not replace �eljko's but supplement them, and should be labeled "alternate depictions." 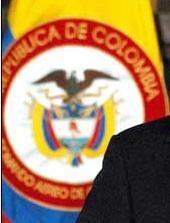 Fuerza Aerea Colombiana uses a thiner vertion of the national flag as its fin flash. Source: B. C Wheeler, An Illustrated Guide to Aircraft Marking (1986) [whe86]. ASURFAC (Asociación de Suboficiales en Retiro de la Fuerza Aérea Colombiana, Retired NCO's of the Colombian Air Force) is an organization that has its own symbols. It consists of the plain Air Force flag pattern with the Coat of Arms of the ASURFAC on the middle. The Air Force Social Action "Our Lady of Loreto" was established in 1972. It has a new flag, the colors being the same, but with a new logo. This picture taken on July 11, 2013 during the F-Air air show.